The holidays are upon us, and as the year comes to a close, it’s the perfect time to thank the people we do business with. It is important to acknowledge those who have supported us throughout the year, namely clients, but also vendors and employees. Even if you’ve already recognized them in various ways throughout the year, there is nothing like a holiday card to show your appreciation and send warm regards for the coming year. Email and social media greetings are nice, but not everyone will read them, and they are far too impersonal. Physically mailing a card with your real signature- and ideally a hand-written note- will have a much greater impact. Remember, the purpose of these cards is not to be an advertisement for your business. As such, they shouldn’t be plastered with huge logos, sales messages, and pre-printed signatures! This is a gift to the receiver- thanking them for their patronage of our business throughout the year. Another great reason to send holiday cards is that it gives you the opportunity to keep business relationships alive on a personal level. This should include people you may not have dealt with this past year- especially if they aren’t local, and your chances of casually crossing paths again are slim. There is great value in sending out holiday cards to clients. Be sure to set aside some time in late November or early December to hand write cards (at least your signature) to all the people who contributed to the success of your business, past and present. 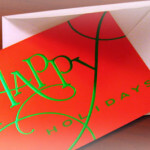 Are you using holiday cards to thank your clients? If so, what creative ways has your company used greeting cards to thank your customers? Let us know in the comments below.